Have I ever told you that I am one of those people who will pay extra for a hardcover book? What to know why? Not just because I feel it will last longer and stand up to the wear and tear for children but I also feel the need to be able to read the title of the book when it is sitting on the shelf. I find I get irrationally irritated when I have to pull out a book from the bookshelf just to read the name. I have occasionally grabbed a book thinking it was the one I wanted only to find out later when I pull it out of my backpack that I actually grabbed the wrong book. I am not sure if I am the only one out there with this weird obsession or not but either way when it comes to my book buying I will always prefer the hardcover. That said, here is a lovely hardcover book that my mom bought my a few years back that I may be slightly in love this. This book is so sweet. It really captures the childhood crush perfectly. The whole "I like you so I am going to pretend I am not interested and do nice things for you and be mean to you all at the same time" thing is so true and real, at least it was for me. Although it is a children's book I would say the theme is quite an adult one. 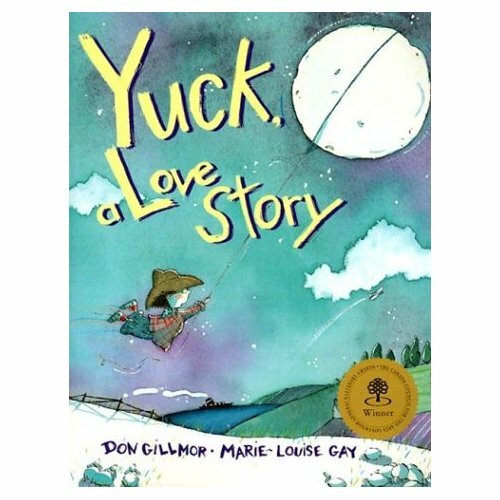 Not to say that it is bad for children, no it is a great read for children and I read it to children often, I'd just say that it speaks to adults just as much, if not more, than it speaks to kids. It really is a fantastic little book with a sweet message about love. On top of the sweet story it also has lovely illustrations. The pictures are bright and colorful, they are cheerful and for some reason remind me of my childhood. They just bring me right back to my home on Minter Street. I am a big fan or Marie-Louise Gay. Don Gillmor may just be my new favorite romantic writer, I'll have to do some research on other books he has written and see if there are an more love stories. So, if you have some free time this week and you feel like a love story pick this one up...you wont be disappointed.